I was unsure if I was going to finish this before the deadline for the Cricut Design Space Challenge – but it appears I just might make it in time (whoa!). I mentioned yesterday, my team’s theme for this round is “Dreamy White Holiday,” and for me, it means time with friends and family (and snow!). The holidays weren’t just filled with family and a few friends coming through our door while I was growing up. More often than not, they were filled with individuals from one of the ships my dad was stationed on – or whatever post he was currently serving in the Navy – who couldn’t make it home to their own families. My parents opened our home to them and no matter what, there was always room for one more. My parents would borrow folding tables and chairs from the church to make sure everyone had a seat. And somehow – almost as if a magical spell was put over the house to enlarge it – our home was full of food, drink and laughter for Thanksgiving with neighbors and family, new and old friends, all sitting together. These moments have always had a profound impact in my life and taught me what true hospitality means – it’s not just opening the door to others but welcoming them to the table and inviting them into the conversation. 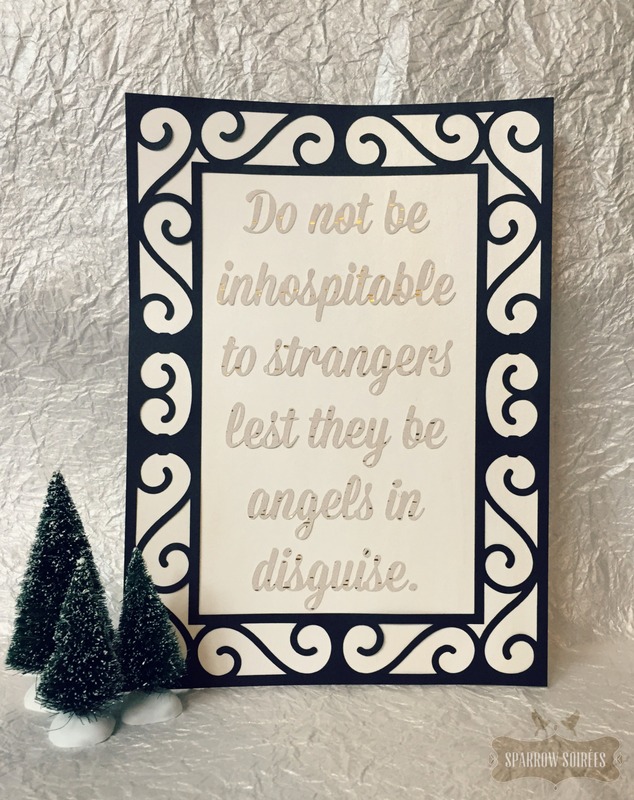 I created the text in PicMonkey, using one of my favorite fonts, Mission Script; then uploaded it into Cricut’s Design Space. From there, I edited the design, making sure it would cut correctly with the Explore (see my woodland menu post for design uploading tips). Once everything was cut, I painted the background card with a gold shimmer watercolor in hopes that little shine would catch a second look. I then added the frame, using a roller tape to secure it to the background. To help place the words, I used the cardstock sheet to center the words and keep them properly aligned on the background. Using roller tape on the words’ backside, I taped the top half of the letters to help them stick to the card. See the above for the tips on going about this method. If you’re looking for other options, you could use vinyl letters, which will act like stickers, or use Cricut’s Print & Cut. At 7.5×10.5″ it’s just the right size to pop into a frame or to prop up in a special place as a reminder. I added the cut frame to the layout to help, well, frame it – but that’s completely optional. Thank you so much for being a part of this Design Space Star adventure! I hope you come back and visit – I have a few holiday DIYs along with some fun and handy ideas posts about hosting, gifting, and a few other surprises I’m excited to share with you. 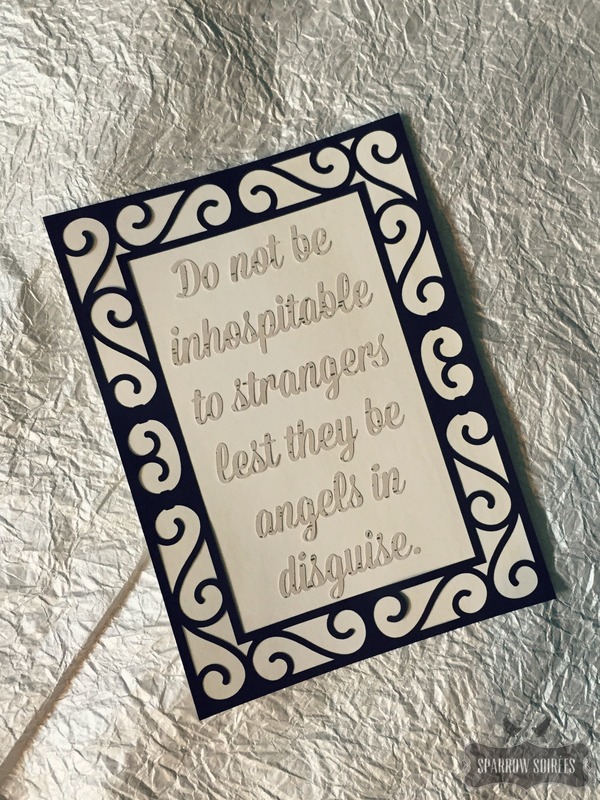 Until then, have a wonderful holiday season with your loved ones – and possibly a few angels in disguise. Just a reminder to please visit Cricut’s Design Space Star board on Pinterest. My team and I truly deeply appreciate you repining our projects to your own boards. And yes, it can help us advance in the challenge (*wink*). UPDATE: you can quickly find my project on their board by clicking this link to repin to your own board. Thank you so much! Disclosure: This post contains affiliate links. I’m also a member of Cricut’s Blogger Network. I may receive prizes in exchange for a winning project with Cricut Design Space Star. All opinions are 100% my own.